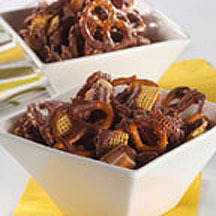 Here's a winning party mix for the sweet tooth -- toasted cereal squares, dry-roasted peanuts, pretzels mingled with caramel and milk chocolate! Simply irresistible! Microwave morsels in medium microwave-safe bowl on MEDIUM-HIGH (70%) power (100% power for semi-sweet chocolate morsels) for 1 minute; stir. Microwave at additional 10 to 20-second intervals, stirring until smooth. Pour over cereal mixture; stir to coat evenly.